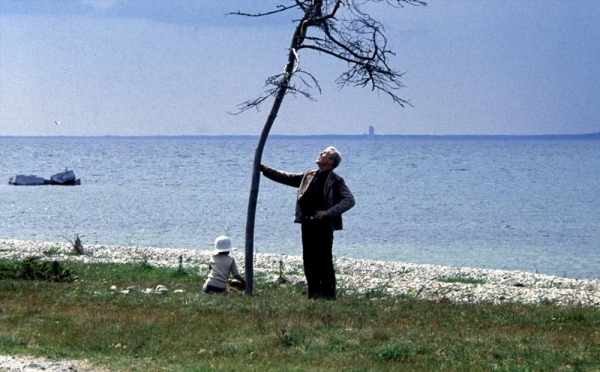 Andrei Tarkovsky’s last film The Sacrifice (1986) is about Alexander, a recently retired professor who hopes to spend the rest of his years with his wife in his large, beautiful house on an island. At a family gathering at this house, we see all too human problems – envy, rivalry, unfaithfulness. Suddenly, rumbling sounds come from a distance and the television announces that a nuclear war is about to break out. The pettiness of the party gives way to an ominous silence, and everyone decides to go to bed for the night. After a while, Alexander emerges from his room, and goes down on his knees to pray to God. He prays that the war be averted, and promises God to give up his dearest possession if his prayer is answered. The night passes. The next morning, we hear on the television that the war is indeed averted. Alexander remembers his promise. He decides to give up his most dear possession – the house he planned to spend the rest of his life in – to God. While the family sits in the large farmland outside, Alexander sets fire to the house and stands at a safe distance to watch his house burn down to ashes. The family members are shocked but helpless. They call the mental asylum, which sends an ambulance to take Alexander. The film ends with a long shot of Alexander – now perceived as mad – being taken away in the ambulance. The camera then moves to a dry tree on the other side of the island, which Alexander used to water along with his little grandson. J.S. Bach’s St Matthew’s Passion plays in the background and the camera slowly moves from the branches of the tree down to the base, where the grandson is sitting. “For my son Andriushka, with faith and hope”, say the subtitles, in a message from the director, who was dying of cancer as the film’s post-production work was being finished. The credits roll. 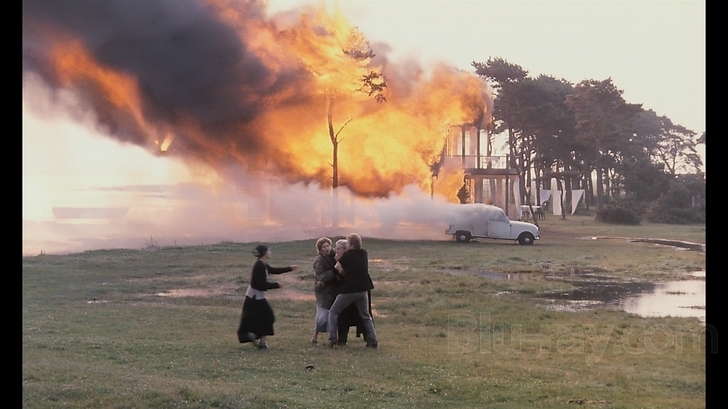 Like most of Tarkovsky’s cinema, Sacrifice is a parable about faith in a higher reality and the possibility of a life lived in communication with that reality. Everyone thinks Alexander to be mad, but for Tarkovsky he is the hero of the story – the only one who, when the nuclear war breaks out, has hope rather than despair. While everyone else struggles to sleep, Alexander prays in the knowledge that the events in the material and emotional worlds around us are rooted in a deeper, transcendent truth. He lives for this truth and attempts to communicate to it. Alexander’s prayer is not merely a plea sent out to God, but the beginning of a reciprocal relationship with God. The manner in which events turn out, both in the inner and the outer worlds, is God’s response to Alexander’s message. And Alexander responds to this response with another message – his sacrifice. What is important is not that his desire is fulfilled, but that he does establish a relationship with the transcendent, however he envisions it. Sacrifice is one important method to establish this relationship, for it drives home an awareness that we are more than our needs and aspirations of the moment, and are willing to give these up – as an offering – to a higher being. The discipline we may put our lives through – for instance, by praying at particular times, or by fasting – is a small example of sacrifice. There are larger sacrifices, the archetypal one being Abraham’s intended sacrifice of his son Isaac, or Jesus’s willfully dying on the cross for it was God’s will, as he saw it. At times, however, sacrifice might turn into an egotism. The man who deliberately sacrifices spending time with his family because of his investment in work is perhaps such an example. For Tarkovsky, a sacrifice is truly so if it means foregoing something in the present, but only for the sake of that which gives form to our relationship with the transcendent. Else, it is denial of one part of ourselves for the feeding of another part. At times, we may realise that what we were sacrificing for has now become an egoistic aim because of a change in our circumstances, even if it may have been different to begin with. Continuous discernment, perhaps with the help of a fellow traveller, is called for. The absurdity of the film’s parable is perhaps meant to press the filmmaker’s belief that modern man, in his debunking of tradition, has crippled his own capacity to have faith – the only capacity which qualitatively sets him apart from animals. Physical suffering is diminished by technology, of which modern medicine is a large part, and emotional suffering, similarly, is at least sought to be diminished by the various psychoactive substances, religions, psychotherapies and new-age spiritualities out there. In all this investment of energy in conquering our perceptible world, we forget that our real roots lie in the transcendent, and that none of our optimistic technologies can help us communicate with the transcendent. Only a life lived in faith can. “What then is the purpose of this [artistic] activity? It seems to me that the purpose of art is to prepare the human soul for the perception of good. My purpose, as far as possible, is to make films that will help people to live, even if they sometimes cause pain.” – Andrei Tarkovsky. ~ by tdcatss on August 25, 2013.